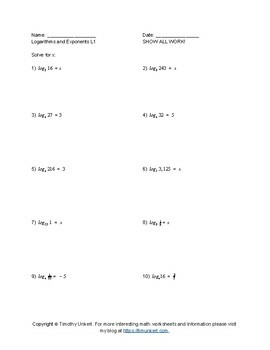 This 4 worksheet pack with an included quiz starts off with logarithms, simple at first then progressing in difficulty, before moving onto exponents. 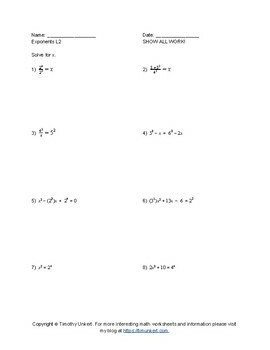 As you progress through the worksheets with logarithms and exponents you move on to more difficult equations, including a couple quadratic equations that you must solve. 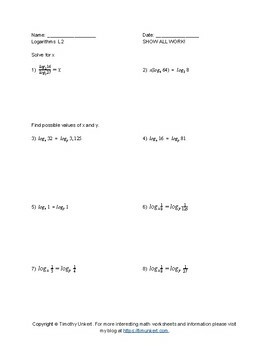 Students are also asked to find possible values of unknown variable involved with logarithms and exponents. 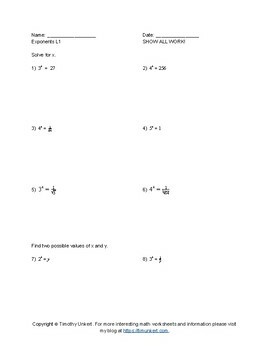 The quiz has a mix of questions ranging in difficulty to give teachers a good perspective on a student's understanding of the concept. For more info about who I am and the worksheets I create and topics I cover please visit my blog at https://timunkert.com.